DYC-Q series low vacuum electro-magnetic pressure difference|Vacuum Valves|Vacuum Pump - Vacuum Pump - EVP Vacuum Solution! Description: DYC-Q series low vacuum electro-magnetic pressure difference valve is a new vacuum valve which has been installed in the gas inlet of the mechanical pump. DYC-Q series low vacuum electro-magnetic pressure difference valve is a new vacuum valve which has been installed in the gas inlet of the mechanical pump. The working principle is the valve and pump should be connected in the same power . 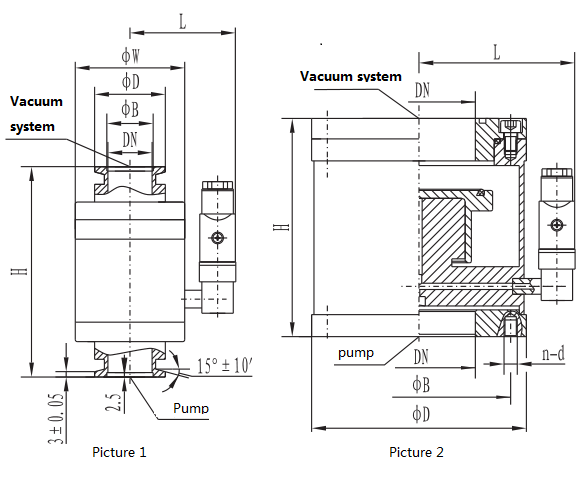 When the pump stops working or power supply is suddenly interrupted, the valve will depend on atmospheric and vacuum pressure on making the valve plate closes automatically, will be closed Vacuum system to maintain their vacuum, and the atmosphere through the throttle valve into the pump chamber in order to avoid pump oil return to Vacuum system. In this way, it protects the Vacuum system and is beneficial for the re-starting of mechanical pump.